100% solution dyed acrylic is our most recommended and used fabric. 100% acrylic has exceptional color brilliance, luxurious finish and fade resistance because it originates from colored acrylic fibers that are spun into yarn and then woven into fabric. The result is a superior fabric of exceptional durability and color brilliance that is warranted for five years to remain serviceable, and will not fade, rot, or mildew. Special formulated inks are printed and fused into our acrylic banner fabrics with a proprietary high temperature process, and remain pliable and color fast through the lifetime of the banner. The combination of fused thermal inks and 100% acrylic fabric give exceptional serviceability and value to our banners. 1) Top and bottom rod pockets are constructed with fabric across the entire width of the pocket, secured with double-lock stitching and back stitching in areas of stress. 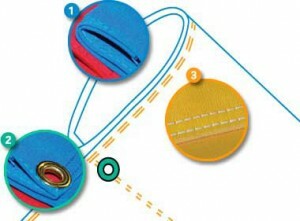 3) Side hems are double rolled and double lock stitched reducing wear on banner edges from wind stress.